The Shipwreck Arcana is a real game about a fictional deck of cards. The deck exists in a world which is described only as "sunken" or "drowned." The world's history is unknown -- but it is hinted at by the fictional illustrator of the tarot deck, providing a glimpse of the history that surrounds it. There are two discernible plots which influence the card illustrations within the main deck. However, the collected promo cards supplement that with a third tale, one that already underpins the deck and the fictional world it exists in: the tale of The Hours. It begins at Dawn, this tale. When the light ascends and the land is laid bare, it begins. The sun shines down upon land and sea, separated by the cold smooth sand. You might think its light falls equally upon both realms, but this was never so. Though the waves feel the light, the depths do not. In that abyss sleep the drowned, the dead, the darkened. Most dream, of a sun long lost. But some do more than dream. So it was that a nameless ghost -- nameless in these depths, name stripped away, name floating somewhere far above and long ago -- woke in her silted cradle and remembered light. She trekked far across The Deep, following a glimmer or a lie, but it does not matter. She found light: The Lantern of the sun, its candle burning without air. It reminded her of what she'd lost. The darkness held. She could not see the ripples, the waves she'd begun, but in the sky above it could be seen. It could be seen at Dawn -- for Dawn did not come. The sun and moon had been split Asunder, and the sky was cracked. Midnight came, holding a bone-white moon over the world. She held it low, searching for Dawn her brother, but all the moon saw was night-drenched sand. Her hours passed one by one, but Midnight remained. There was no one to take her place in the sky. The seas swelled in pity, reaching to comfort the moon. They broke their sandy shackles and overwhelmed The Shore, drowning a hundred kingdoms in their sorrow. One mattered more than most: for on its shore stood The Belltower, which separates the living air from the drowned depths. It was washed away. In The Deep, the dreamers woke. Mortals whisper of a devil that floats through the black abyss: Leviathan, who swallows islands as easily as ships. The creature is a continent of bone and coils, bringing both doom and sustenance to those who dwell below. Upon its severed fringes the drowned will teem, engaging in The Feast which never satisfies. In the sun's absence, this hunger only burned brighter. It lead the drowned like a torch, guiding them through The Passage which had been unlocked by The Belltower's fall. It lead them through twisting corridors rotting with gold, past frenzied eyes that flocked like stars overhead. It lead them onto The Shore. You may recognize them. In The Deep they were fleshless bone, but now clothed by air and moonlight, they don familiar faces of long ago. Most want only to breathe deep, to taste food again. A few have darker urges, and it is small thanks that no sun remains to illuminate their wake. Did all escape The Deep? No. Some of the drowned remain, and new mortals continue to be ferried into its halls by The Pallbearers, whose work is unhindered by Midnight. Iron masks hide their faces -- if they ever wore faces. Their path is quicker than it once was; busier, too. But they are the ones who made The Passage. It was meant for them, and those they carry. Our tale might end here -- the world in fathoms, Dawn shattered, dead souls unfettered and ill at ease. But in these darkened times, even the faintest candle will catch our notice. It is yet a ways off, but it flickers in the distance. It begins as a sinking ship. The Hours slip away one by one as wood sinks beneath waves. Can a ship die? Has it died already? Or does it breathe as its captain does, taking one final bite of the salted air before the black waves wrap it tight? The ship dies, but The Captain does not. She watches her vessel and her crew descend. It is many years before she stands on dry land again, but the image never fades. She will not forget The Hours and what they took from her. She stands upon The Shore, staring down the black corridors that lead below. The Passage leads to her ship, her crew. Where else does it lead? Who but The Pallbearers can navigate its depths? The Hours may have robbed The Captain, but she has made good use of the years. The Wish is what she's gained: a gift from an indebted spirit, to be granted at her request. She can ask for anything she wants, but she knows what she needs. She leaves behind only footprints and a black feather at the mouth of The Passage. Somewhere in the maze, beneath seas, beyond death, she searches: for her ship, her crew. When she finds them, she does not turn back. The Passage is not the only way out of the afterlife. Why return to a drowned world, when there are others to explore? She does not know it yet, but her search for other worlds may save her own. The trail she blazes through The Passage to other lands, strangers will pass through on their own journeys to this one. He is one such stranger. He may have come through The Passage for gold, or lore, or to escape. He may not even mean to find this world. But he is fated to -- it is his Fortune. What will he do with it? He will not leave it to chance. The deck is in his hands. He reads the cards to find out. In the cards he sees The Mirror, cracked. He sees the moon, unreflected. The Mirror desires balance. It calls out for a new sun. We have spoken of The Deep, but there is another darkness, a different darkness. It is not crushing but empty, so empty, so completely and nearly empty. And yet filled beyond measure with stars. One star hears The Mirror's call, and bends its voyage towards this world. Its heart is Iron. It will be here soon, ready to be forged into something new. There are two discernible plots which influence the card illustrations. The second is a classical tragedy: the tale of The Prophet. His gift was sight: not of the world before him, but of the years. This gift he employed in the service of peasants and patrons, of cooks and queens. His eyes burned with untold horizons, and yet: a dark cloud gathered. Obstructing his sight came a doom -- his own doom. It was impenetrable and inescapable. It drew nearer, obstructing other fates in its path. The Prophet set out in search of salvation, begging every patron past and present for aid in these dire straits, but only one had the answer: The Lord, Akela. He basked upon a throne built over many years and many wars, each of them won under The Prophet's guidance. His sword carved stone Asunder. His fleet canvassed the sea. And in his throne room sat The Chalice, which never runs dry. It came back with Lord Akela from a crumbling kingdom across the sea. None had dared to taste it, for The Prophet himself had warned that its ichor was not for mortals. But now, faced with his doom, The Prophet wished to be mortal no longer. Let me taste it, he begged The Lord, that I might survive my doom and serve you forever. Did The Lord acquiesce? Or did The Prophet steal a sip of the brew? For certainly it touches his lips. It drips from them still, a venomous slaver running down wicked fangs. He is no longer mortal, The Prophet: but his doom was never mortality. Folly and fear lead him to drink deep, and become The Beast. His appetite and his blind anger soon grew unchecked, and he returned to visit those he had once prophesied for. As each patron met their doom, The Lord heard, and grew angry. He sent his two greatest warriors to curb The Beast's reign. He sent The Huntress, and her lover. He should have sent more. The Huntress survived, leaving her sword behind to pierce The Beast's shoulder. Of her partner, nothing so heartening could be said. Griefstruck, The Huntress journeyed to The Shore of the sea and cast in a medallion: memento of her loss. It sank beneath the waves and found its rest in The Belltower. The Huntress might think her tale ends here, but if she could see down to the depths, her error would be apparent. The Belltower once stood on the very same shore, guarding the boundary between land and sea -- between life and something else. Its fall heralded the end: the sea's rise, the world's ebb. Its foundation still crusts The Shore, while the tower's wreckage lies lost and buried in The Deep. Its bell, long silent, rang out once as The Huntress' medallion struck it. Upon The Shore, a pause. The Huntress had departed, her footprints washed away. Yet other prints have appeared, trekking into the water. Travelling from life to something else... or perhaps returning. A mark upon her back shows how far she has come, how far she has yet to go. A face hidden beneath sea-soaked hair would be unfamiliar to even The Huntress now. She is The Stranger. She wields no sword or rifle, carries no weapons to strike mortal foes -- for she has not returned to hunt anything mortal. The Beast lies before her like a heart before an arrow. She has been loosed by the sea into a world one step closer to ruin. She will find her mark soon. 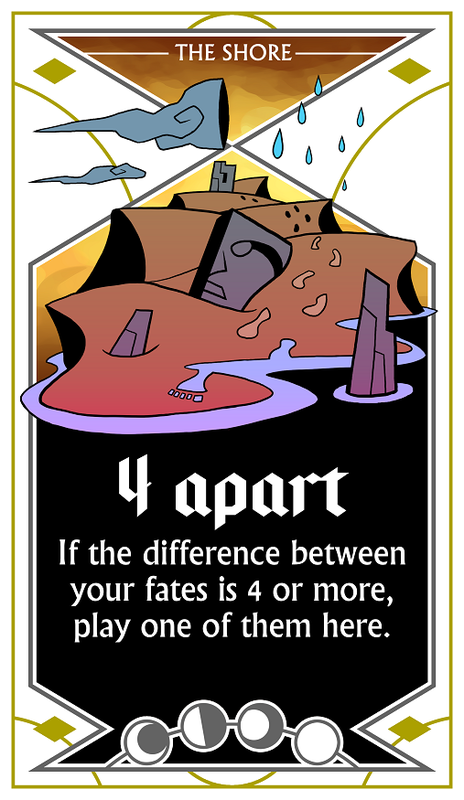 There are two discernible plots which influence the card illustrations. The first is more mythical in nature: the tale of The Blind Man. He was once merely an aged inventor. He still had his sight then, and what he saw horrified him: the world breaking and being slowly dragged underwater. What caused this apocalypse? It is not known, and the cards offer no hint. But it was the last thing that The Blind Man saw. He took his own sight. Some say he tore his eyes out and fixed them in the sky, replacing the sun and moon that were broken. Others hold that the sun never died, and The Blind Man gazed into its fires in search of a celestial blueprint, until his eyes were dry ash and his mind was alight with strange new inventions. The man himself will not say, for he is consumed entirely in his construction of The Engine. Its workings are unknown, but its goal is simple: to wind back the waves and years, restoring the world and resetting the calamity. It is powered by a beating heart, whose rhythm shakes the earth for miles around. Is it The Blind Man's, lost along with his sight? Or was it carved from the flesh of the sea's silent devil: Leviathan? One thing is certain: The Engine is nearly complete, but one vital element is missing. The keyhole in its hull does not fit any key made by mortal hands. It is crafted to fit an heirloom of years faded and past, a relic discovered in The Blind Man's studies. The Engine will not start without it. It is The Key. Finding it will not be easy, for The Key is locked within an iron box that only The Key itself unlocks, cast away into the coldest, blackest, deadest crags of the crushing sea. These unlit lands are a footstep away from the afterlife, and home to things that have not lived for ages, or will not for ages yet. This is The Deep, where cold titans dream. Who can recover The Key? How will they journey into The Deep and return to the air above? A mystery. Yet the cards reveal that someone must have done so, for The Key now journeys fast across the land, carried to The Blind Man's forge by The Rider on her stolen steed. Her flight across the map has not been easy. She chases the sunset, pursued by night's long shadows and the agents hidden within. Mortal and immortal laws have been broken by her hand, and their keepers seek justice. The burning brand upon her arm signals to everyone that she is wanted by The Judge. But she will not rest, she will not tire, she will not cease. The Rider bears The Key, stampeding towards Dawn and The Blind Man's work. If she succeeds, if she escapes her pursuers, she may yet return the missing piece to The Engine that can undo all wrong. Or she may just be another page in a story.